Yet to find an Aussie that could explain the homologation story in any real detail. Collectable Classics has a few P cars at the moment. The latest one is a $15k Boxster. Shady Speedway replied to Niko's topic in Not Porsche - Everything Else. Ferdinand Porsche built an electric car over 100 years ago that broke every record that existed. It had 4 motors. 1 inside each wheel hub. How can this book be so expensive??? There is a book on early 930s from Parabolica Press. It's around the same money. I nearly bought one knowing it was the holy grail of specific detals on these cars. I sold the 930 so never bought it. I would no doubt have learnt stuff I could not learn anywhere else. I have a substantial Porsche book collection. Every one of them has fuzzy, incorrect, misleading and contradictory tails about the early cars. You get what you pay for sometimes. Only if you fail the A test when you're pulled over. I've studied early 930s for 5 years. Don't know everything about them. But what I do know about them is the knowledge base in Australia is limited to say the least. I think ROW cars recieved what the importer thought was the best bit of kit for the money. Australian cars recieved all sorts of head units depending on year and dealer. Better off trying IB forum? Where to buy Spark Plugs, Coils? Advice needed! Nobody can drive a car and tell you what spark plugs are in it. The difference is the failure rate and life span. Shopping trolley or race car. It's NGK or you're wasting your money. The brake calipers are easy. Don't split them unless you absolutely have to. Put the calipers in a Hessian bag and pop the pistons out with compressed air. Clean eveything with scotchbrite and metho. Assemble with rubber gease. Clean complete assembly with wax and grease remover. Paint with caliper paint. I did mine in silver. It helps seal up the surface and allows for easier cleaning. Bleed starting with the furthest caliper away from the master. A full description of the operation would run to a page or two. Go to you tube university for other opinions and explanations. Find a mate that has done it before to guide you through it. Though i will say. One thing I learnt in the automotive industry..... if a customer buys a part and has to ask "can I fit this myself" It's probably an indication that they shouldn't. This happened to my brother in law. The family hopped out the Prado to head in to the shops. Upon realizing he had forgotten his wallet, he walked back to the car. Not a minute had passed. There was smoke coming from the lid of the center console where the light concentrated from the water bottle was focused. That car would have burnt to the ground had he not returned. There are youtube videos on how to start a fire with water in a plastic bag. Just ate all my popcorn watching the movie. Going to get some more for this thread. You're all missing the point. The lead role is the car. I'm not 100% sure? 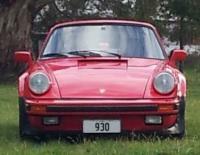 Though the first time I saw a 930 was in the early 80s, it was silver and it was in Adelaide. I was about 9 years old? I do remember the exact location. There is every chance, this was the car I saw. It may be the reason I now own mine. I remember spending days getting the rear ride height settled with those spring plates. You know how the spline system works? It's loads of trial and error, but it's very satisfying when its settled. It's best to do the final tension on the suspension when the car in on all 4s. So everything is nipped up in the home position.